It was February 2011 when I had my water baptism. It was in Siloso Beach in Singapore. For me, it was like a magical event. I was surrounded with friends and brothers and sisters in Christ. On that day, I felt that I made the right decision and that I made Him proud and happy. And behind those smiles was a heart of joy and fulfillment and it was so touching and I was so emotional. I was so fortunate to have my leaders around me that convinced, explained and made me realize the importance of public declaration of faith. Baptism is from the Greek verb "baptidzo" which means "to immerse". So basically, when a person is baptized in water, his or her body is totally immersed in the water and brought out again. It also symbolizes the death, burial and resurrection of Jesus Christ and our identification with Him in them. So what is the meaning and significance of being baptized? We can narrow it to these sections. Identification and Union with Jesus Christ. When a person receives Jesus as Lord, he identifies fully with what happened to Jesus. Water baptism is a physical act that should indelibly mark the mind of the person being baptized with the reality of his union with Jesus Christ. Public Testimony. It serves as an outward sign and testimony of inward grace. It is like given an opportunity to openly testify to others of his born-again experience. When a person is born again, he is baptized by the Holy Spirit into the body of Christ. The Old is Gone, the New Has Come. When a person being baptized is under the water, it is like a representation of being buried and a proclamation that the old you no longer exists. The symbol of coming up out of the water signifies our being raised to new life with Christ. It is now living and making Him the Lord of every aspects of your life. Not the Act that Saves Us. We should be reminded that water baptism is not the act that saves us. It is actually the act that symbolizes how we are saved! We have first to accept and make Jesus us our Lord and Savior and believe that God raised Him from the dead. 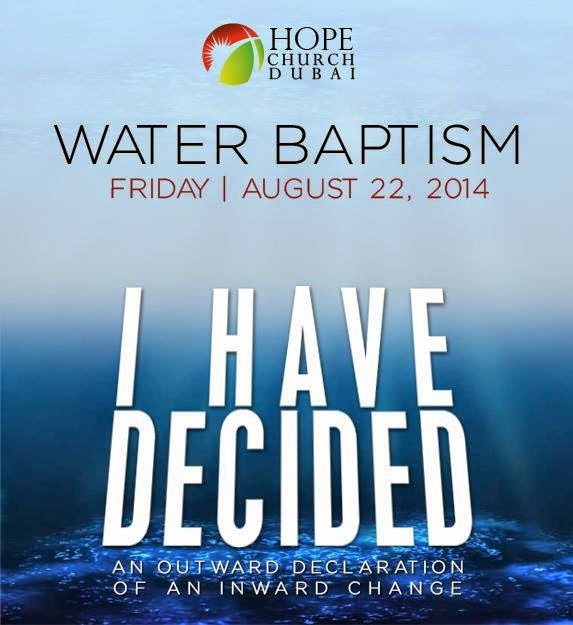 Water baptism is an experience after salvation confirming and strengthening our commitment to live a godly life.